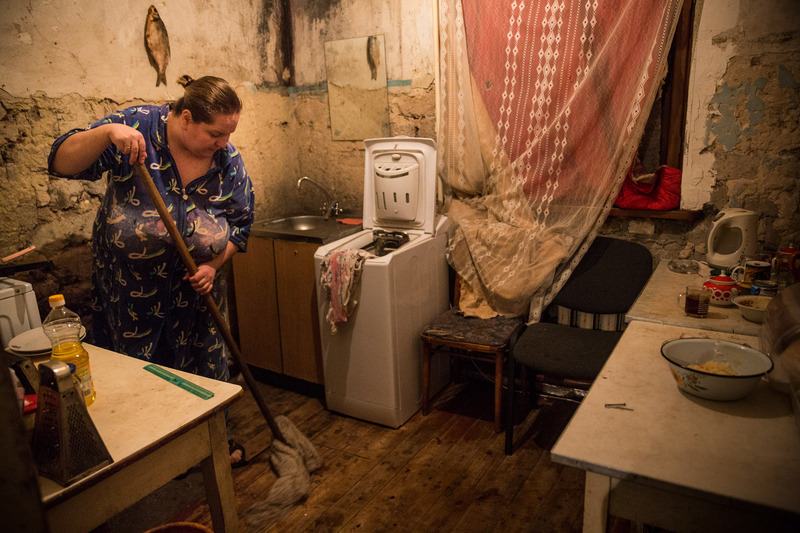 Eleonora Tsvetaeva, who has been forced to live nearby in the basement of the Petrovskiy neighborhood cultural center, cleans her kitchen floor on a rare trip home due to a ceasefire between Ukrainian forces and pro-Russian rebels, on March 1, 2015 in Donetsk, Ukraine. The Petrovskiy neighborhood of Donetsk has been heavily attacked by Ukrainian forces, causing most residents to flee, and others to move into the basement of the cultural center. People have been living in the space since June, 2014.